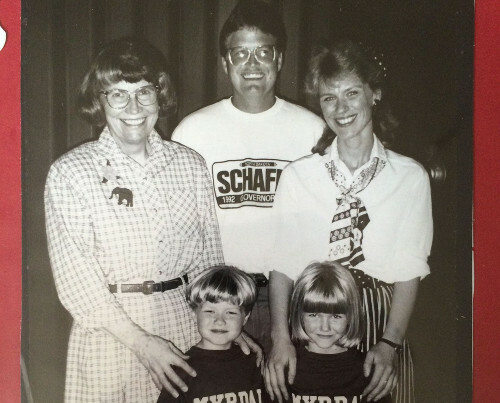 Megan Myrdal (bottom right) pictured with her twin sister, parents, and grandmother, the respected former Lt. Gov. Rosemarie Myrdal. Earlier this week, State Sen. Janne Myrdal (R-Edinburg) was caught sharing a gay Nazi flag on her Facebook page, making her the subject of widespread criticism. She later deleted it and claimed she posted it by accident. Her niece, Megan Myrdal, wrote about the controversy in a Facebook post. Here it is, reprinted with the author’s permission. For as long as I can remember, I’ve felt pride in my last name. One of my earliest memories is a kindergarten mock election. In 1992, every six-year-old at Edinburg Public School was given a ballot and no. 2 pencil to select our favorite candidates. As we went through the list of national, state and local positions, my sister and I were proud to “cast votes” for Rosemarie Myrdal (or Granmarie as we call her) to serve as Lieutenant Governor of North Dakota. At the time, we had no idea the significance of the actual election to ourselves, our family or our state as a whole. In my six-year-old mind, it just felt special to share the same name as one of the candidates. Then, on November 3, our Granmarie was elected the Lieutenant Governor, the highest office to ever be held by a woman at that time in North Dakota. It wasn’t until I moved to Bismarck shortly after college that I began to realize the impact of her time in office (seven years in the ND House of Representatives and eight as Lieutenant Governor). As I began to make connection in the Bismarck community, I was amazed by the reactions I’d receive when people learned I was related to Rosemarie Myrdal. From folks who worked in child protective services, to tribal affairs, to coal and oil refining, and everything in between; Granmarie had respect and praise from groups on both sides of the aisle. I heard comment after comment about how she made time for anyone, giving thoughtful attention and respect to every issue. I had always known my grandmother was special, but it took leaving my hometown to realize that she had made such an impact – far beyond the borders of my family. I quickly realized that having her as a grandmother not only enriched my personal life, but also gave me unearned professional respect from others. People more important than myself, who had no business talking to me, wanted to talk to me – they’d share stories about my grandmother, ask how she was doing and wanted to hear about my life. People gave me more time and attention because my grandmother had given them time and attention. People gave me undue respect because of the respect they held for my dear grandmother. She gave me and other members of my family a great privilege to share her last name; a last name she worked diligently and thoughtfully to build the respect it carries. And today, I feel that name has lost some of that respect. I post this because of recent social media activities from my aunt, Janne Myrdal, who is currently serving as Senator for District 10 in North Dakota. In the same ways that I’ve benefitted from sharing my grandmother’s name, I believe Janne benefitted in her political rise. It opened doors that would have otherwise been closed. It allowed her to build relationships that she would have been unable to build. I believe people gave her, like me, unearned respect. My grandmother once shared a story about a conversation she had with a hometown gentleman shortly after finishing her time in office. During their chat, he told her that she was an okay politician but she never really stood for anything. I asked why he felt that way and she said because it had truth. She told me, word for word, “there is no place for ideology in politics” and that was precisely how she conducted herself as a politician. It’s taken me awhile to fully understand and appreciate the importance of this statement. She has and still holds very strong beliefs, both personal and religious, but she was a disciplined, kind and pragmatic politician who put ideologies aside and worked with all people to solve problems. I can only hope Janne will recognize the duties of her elected position and the appropriate place for her ideologies; as well as social media behavior. Her personal and religious beliefs have no place in North Dakota politics, and are simply irrelevant to the issue of civil marriage. I grew up feeling pride in my last name with little context or understanding. As I’ve gotten older, I’ve learned more about the people who gave it meaning. It is from that strong sense of character and desire to do good for all people that I feel pride and hope to live a life that gives it the respect it deserves. 2 Comments on "Megan Myrdal: Family Name “Has Lost Some of That Respect”"
Megan Myrdal is a class act. She is a thoughtful, brilliant, educated, broad minded, and kind woman. I am happy to know her. She is capable of many things and if she follows her grandmother’s calling to public service we would all be blessed with good fortune. We have few statespersons as it is. She would add leadership where I see a dearth of it.